Cooler Master unveils the CM Storm QuickFire, a new mechanical gaming keyboard with a MSRP of $99.99. The keyboard has Cherry MX switches and features a partial red LED backlight. There are four versions available: Cherry MX Black (strong resistance/linear feedback), Cherry MX Blue (low resistance, force feedback (click)), Cherry MX Brown (medium resistance, force feedback (bump)), and Cherry MX Red (very low resistance, linear feedback). You can find the specifications at this page. Cooler Master, an industry leading chassis, thermal solution, peripheral, and accessory manufacturer, today announces the next incarnation of the extremely popular QuickFire Rapid Mechanical Gaming Keyboard, the QuickFire Pro. Featuring a smooth and clean aesthetic, QuickFire Pro includes laser-marked keycaps and a non-glossy matte finish. This is complemented by a set of extra keycaps (includes a key puller) that give the keyboard an extra appeal that draws other gamers in. A response time of 1ms, in USB mode, offers gamers a necessary consistency to navigate the ever changing landscapes of their video game libraries. With the Windows Key being disabled in GAME mode, users will no longer worry about possibly losing a match from accidentally minimizing the game. Multimedia shortcuts are available to ensure that media can be controlled with ease. With N Key Rollover, users deploying the QuickFire Pro in either USB or PS/2 mode can activate many keys on the keyboard simultaneously. Pro gamer themed red LED lighting is present in common game keys such as WASD surrounding gaming cluster. Offering the best available mechanical hardware, QuickFire Pro integrates Cherry MX switches. These provide the QuickFire Pro with the ability to respond to, and recover from, furious button presses with almost zero lag. Vastly improve your possible gaming actions per minute by utilizing a QuickFire Pro Mechanical Gaming Keyboard in FPS, MMO, RTS, and other games. Cherry MX Red, Black, Brown, or Blue switches availability will vary based on region. Travel with ease by simply removing the included braided USB cable and storing it. While attached, the braided USB cable can be routed through cable management grooves in the back of the QuickFire Pro. This prevents unsightly cable clutter and helps minimize risk due to a hanging cable catching a foot or leg from a loved one. 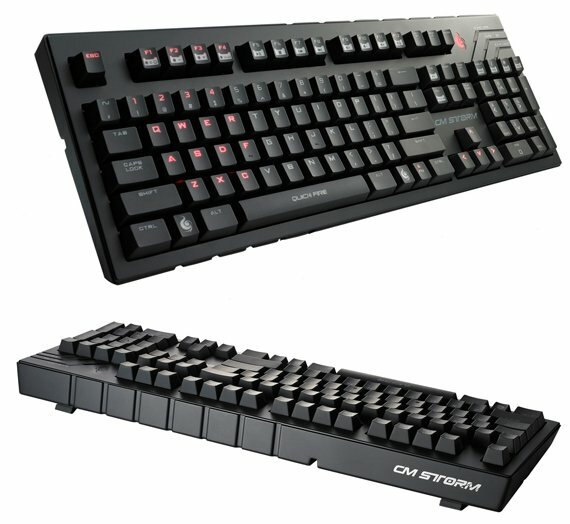 CM Storm QuickFire Pro will be available on April, 2012.